A race against time is underway in Alaska to find the remains of a Southern California Air Force Captain, and nine other servicemen, who died in a military plane crash in 1952. The C-124 Globemaster with 52 military members onboard was on its way to a base in Alaska when it somehow struck the side of a mountain. The families of the men, including that of Captain Jerome Goebel from Vista, tried to hold out hope. “They were just trying to hang on to something,” Captain Goebel’s nephew Dan said. But the crash into Mount Gannett in the remote Chugach mountain range caused an avalanche which buried the plane deep beneath the ice and snow. Three days later, a small crew was able to fly over the area and verify the plane had crashed. The crew saw no survivors from above, and was unable to get to the wreckage due to heavy snow and sub-zero temperatures. The plan was to return when weather permitted, but mother-nature did not cooperate and the wreckage remained untouched in the frozen glacier. Captain Jerome Goebel played sports and was part of the first graduating class at Vista High School in 1938. “He was a very loving and kind of a silly character that liked to make people laugh,” his nephew said. He joined the Army and served in World War II as part of the Air Corp. Before he was killed he wrote a detailed letter home describing one of his last missions flying in a P-38 over Berlin, documenting damage from bombings. For 60 years, Goebel’s C-124 remained buried where it crashed. But in 2012 an Army National Guard plane on a training mission spotted the wreckage and determined it could be reached. For Goebel's family, that was the first time in more than a half-century they had some hope of closure. 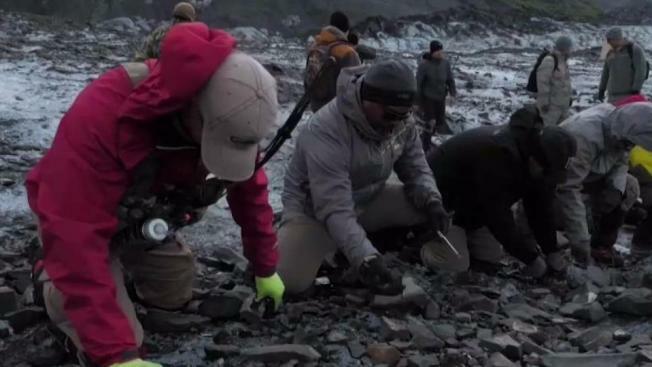 Every June, from that date on, a team from the Air Force returns to Colony Glacier and painstakingly searches for the remains of missing service members. Goebel was 33 years old and a father of two when he was killed in the crash, according to his nephew. “For his son, it's so important because he really never did get to know his dad. He was only a baby at the time,” he said. Crews have to wear specialized gear to comb the rough terrain down on their hands and knees. “You know they have to wear the microspikes on the bottom of their shoes so they don't slip, and of course a lot of cold-weather gear, and it can be very fatiguing outside on that cold glacier,” Dan Goebel said describing the search teams’ mission. Dan Goebel says that every year the recovery effort on the glacier gets more dangerous because as the glacier melts, the ocean comes nearer. The crash site is now only a mile or two from the water's edge. “It'll shift and move around and they can't keep the people on there for too long at a time otherwise they could risk lives,” he added. In a cruel twist of fate, the warming temperatures and melting ice that helped uncover the wreckage after so many years may now cause any additional remains to disappear forever into the ocean floor. So far the remains of 42 men have been found since the effort began in 2012. They were identified using the DNA of family members, along with pieces of wreckage and personal items. Captain Goebel is not among those 42.